Results show progress in some areas; however, faster uptake of improved land management practices is required to meet the water quality targets. Not all activities undertaken during the reporting period are included so results are considered a conservative estimate of progress. In 2015–2016, 394 graziers and 1339 sugarcane growers engaged in industry best management practice programs. Improved nitrogen and irrigation management = less dissolved inorganic nitrogen run-off. Protecting streambanks = less sediment run-off. Australian and Queensland governments investing $763 million from 2013–2022 to improve water quality entering the reef. Overall inshore marine condition moderate - coral bleaching and mortality highly variable. The Great Barrier Reef receives run-off from 35 major catchments, from Cape York in the north to Burnett Mary in the south, an area larger than the size of Japan. Grazing is the dominant agricultural land use (77 per cent), particularly in the Burdekin and Fitzroy regions. Sugarcane (1.4 per cent) and horticultural crops (0.2 per cent) are grown on the coastal floodplain where there is high rainfall and/or irrigation. Grain crops and irrigated cotton are grown in inland areas of the Fitzroy region. Pollutant run-off from the catchment impacts the inshore marine environment. Nitrogen run-off from fertiliser is linked to outbreaks of coral eating crown-of-thorn starfish. Suspended sediment in the water reduces light available to seagrass ecosystems and inshore coral reefs, affecting coral settlement, growth and reproduction. This ultimately reduces the Great Barrier Reef’s ability to recover from the impacts of climate change such as bleaching events and more intense extreme weather events like storms and tropical cyclones. The Reef 2050 Long-Term Sustainability Plan is the Australian and Queensland governments’ 35-year action plan for managing the Great Barrier Reef. Improving water quality is one of the key themes of the plan and it incorporates the goal and targets of the Reef Water Quality Protection Plan which focuses on reducing the impacts of diffuse source pollution on the reef. The draft Reef 2050 Water Quality Improvement Plan 2017–2022 (PDF, 4.5MB) guides how industry, government and the community will work together to improve the quality of water flowing to the Great Barrier Reef. The plan is an update of the Reef Water Quality Protection Plan 2013 (PDF, 4.0MB) and supports delivery of the Reef 2050 Long-Term Sustainability Plan. It addresses all land-based sources of water pollution including run-off from urban, industrial and public lands; while recognising the majority of pollution comes from agricultural activities. 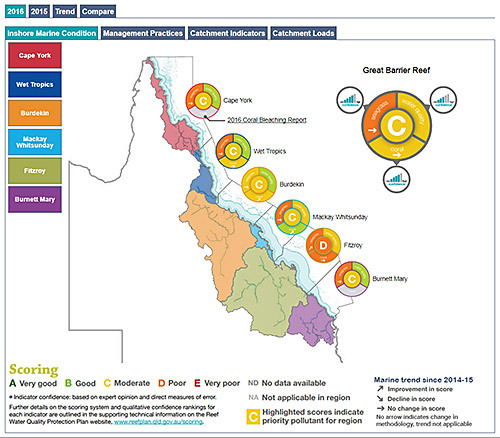 Water quality targets have been set for the catchments adjacent to the Great Barrier Reef, based on modelling and other scientific information. The targets define the reduction in nutrients and fine sediment required by 2025. This provides a new level of specificity from the Reef 2050 targets that commit to achieving reductions of up to 80% in dissolved inorganic nitrogen and up to 50% in sediment in priority areas. 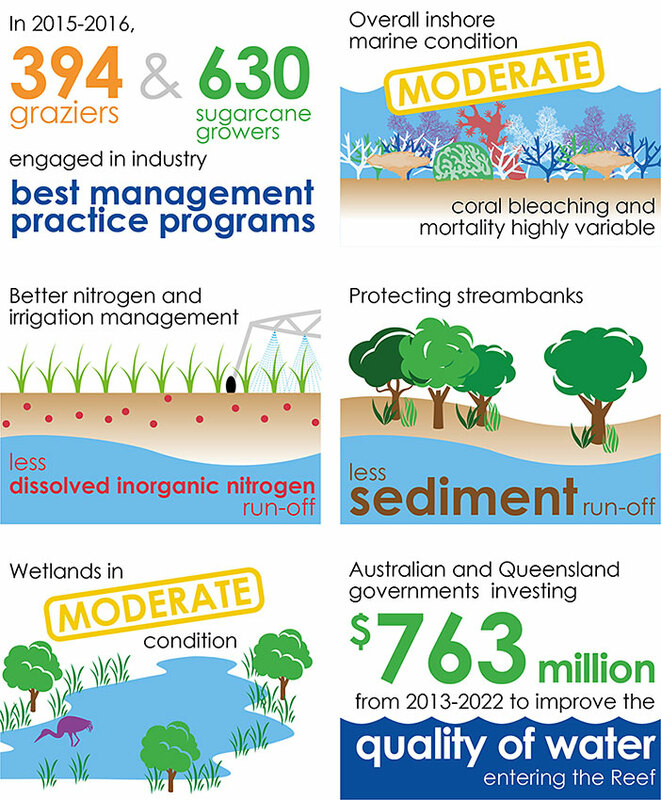 The Great Barrier Reef Report Card details progress towards the Reef Water Quality Protection Plan 2013 (PDF, 4.0MB) targets to 2018. Future Report Cards will assess progress towards the new targets to 2025. The report card outlines results from the Paddock to Reef Integrated Monitoring, Modelling and Reporting program which collects and integrates data and information on agricultural management practices, catchment indicators, catchment loads and the health of the Great Barrier Reef. The Reef 2050 Integrated Monitoring and Reporting Program will build upon existing programs such as the Paddock to Reef program to track progress towards the Reef 2050 targets and objectives in the future.